Although not the healthiest food in the world, is hard to resist the pork cooked in milk. The milk not only makes the meat tender and juicy, but it produces a creamy sauce that makes you feel happily guilty. They are not for every week: only when you need a small feast of cholesterol. This technique is commonly used in Spain with the tenderloin. 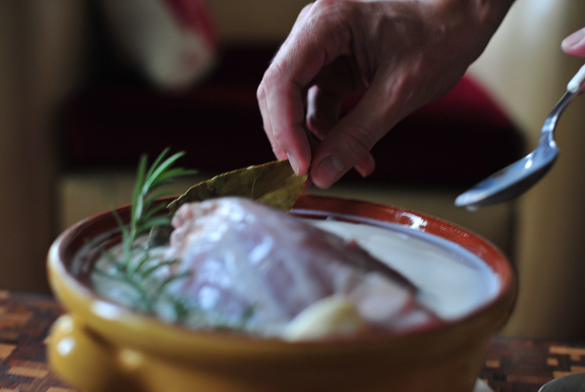 But my proposal, adapted from the book Cerdo e hijos (Pork and children), uses a the shoulder. Cooking, therefore, is longer, but the dish is tastier and more unconventional. And cheaper! Season the shoulder with salt and pepper. Place all ingredients in an clay pot or cast iron with a lid. Bake it for an hour and a half. Remove from oven and remove the thyme, rosemary and bay leaves. Reserve the meat wrapped in foil. Puree the sauce in a blender, and reduce it if it has become very liquid (it has to be creamy but not too thick). Correct for salt and pepper. Beef fillet, adding any juices that have become detached to the sauce. Serve with the sauce. The shoulder is more tender and tasty if you take one or two days after making it. Andaaa…… una receta parecida la preparo con lomo y al fuego, pero al horno.. me llama muchísimo. Ummmm, si no tuviera ya más que planeadas unas albóndigas con curry y leche de coco para la cena de hoy, me pasaba a la paletilla sin dudarlo. Pocas veces cocino cerdo si no es con menta, mermelada y vino blanco o con manzana y envuelto en panceta.